Museum Hours: Sunday - Thursday, 10:30 a.m. - 4:30 p.m.
Bx7, Bx10, BxM1, BxM2 to W. 261 St/Riverdale Ave stop. Walk west on W. 261st St. toward the Hudson River. HHAR gate is on Palisade Ave on the right. 1 train to 231st St. stop or A train to 207th St. stop. Transfer to local bus Bx7 (available at both subway stops points) to W. 261 St/Riverdale Ave. Walk west on W. 261st St. toward the Hudson River. HHAR gate is on Palisade Ave on the right. MetroNorth Railroad Hudson Line to Riverdale stop. Half-mile walk up Palisade Ave.
Brenda Zlamany: 100/100 features 100 watercolor portraits of residents of the Hebrew Home at Riverdale, and is part of the artist’s “Itinerant Portraitist” project. In this project, Zlamany explores the constructive effects of portraiture in communities around the globe. 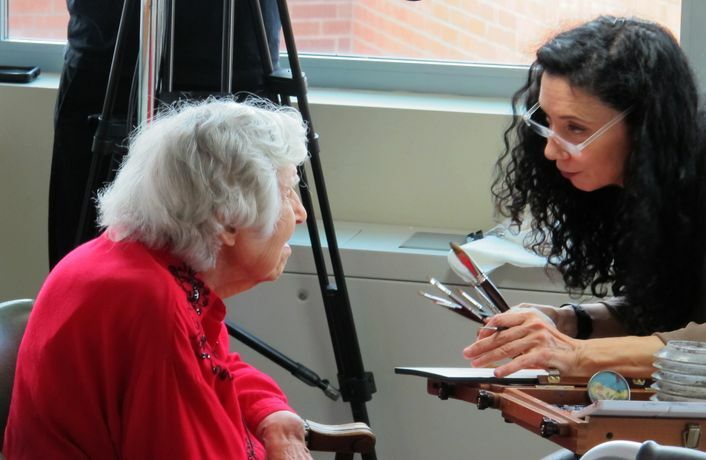 Working with the Home’s residents, most of whom are in their 80s and 90s, with several over the age of 100, Zlamany embraces the collaborative nature of the portrait process, borrowing strategies from traditional art-making (portraiture, watercolor), conceptual art (production according to a predetermined schedule and quota of 100 paintings) and performance art (emphasizing process and the nature of the engagement between artist and sitter). She paints six or more sitters each day using a camera lucida, a device for drawing that dates back to the Renaissance and promotes a two-way exchange between artist and subject. Working in close proximity, with her paper flat, her subjects watch as their image emerges on the page and guide it, consciously and unconsciously. Following in the tradition of the early modern era, sitters arrived all dressed up for the occasion much as patrons would have more than a century ago at the studio of portrait painters like John Singer Sargent. To be painted was not only flattering, but provided time set aside to share their stories. Those private moments are hinted at in the portraits, which convey to visitors to the exhibition a glimpse of the beauty and wisdom that comes with age.